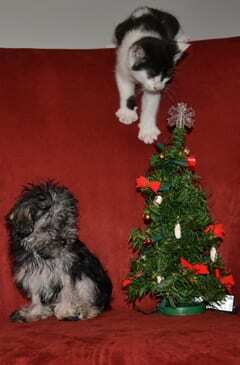 BC SPCA > News Stories > Media stars Binx and Beans have now been adopted! Media stars Binx and Beans have now been adopted! Binx and Beans have been adopted! Thank you to the BC SPCA Burnaby Branch, BC SPCA staff member Rhonda Ott and all the BC SPCA supporters who made this happy ending possible. After months of rehabilitation in foster care with BC SPCA staff member Rhonda Ott, Binx, a kitten who was rescued from severe abuse, and Beans, a Yorkshire terrier who was found barely alive in a Burnaby park, are ready for adoption! Help get them adopted – share this story with hashtag #binxandbeans. The BC SPCA is looking for a home without dogs who can take the bonded pair together and who will be able to care for the special needs of the vision-impaired kitten. For more information, please contact the BC SPCA Burnaby Branch at 604-291-7201 or email burnaby@spca.bc.ca. The BC SPCA is seeking the public’s help with veterinary costs for two baby animals who are recovering together in an SPCA foster home after surviving life-threatening situations. 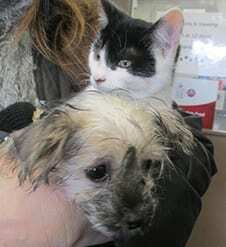 “Beans”, a four-month-old Yorkshire terrier and “Binx”, a nine-week-old black and white kitten are just two of 32,000 animals who received life-saving support through the BC SPCA in 2012. The critically ill puppy was rushed to a nearby emergency clinic, where medical staff worked to raise his body temperature, treated him for dehydration and low blood pressure and inserted a shunt to administer medications and dextrose to maintain his blood-sugar levels. “His survival was touch-and-go for several weeks and he had to be force fed and given medications every two hours to prevent seizures,” says Chortyk. SPCA staff member Rhonda Ott, who has been fostering Beans, says the feisty pup successfully moved from IV fluids to syringe feeding and is now eating like a champ. He has suffered some hair loss, but is gaining weight and getting stronger each day. Binx was surrendered to the SPCA on Oct. 18 by a Good Samaritan who witnessed the two-week-old kitten being dropped, stepped on and mistreated by children in a neighbouring home. He convinced the owners to let him take the kitten and he immediately took him for medical treatment. “Binx was so young that his eyes were barely open but he had already suffered extensive injuries, including head trauma and eye damage. He was also badly infested with fleas,” says Chortyk. Binx received emergency treatment for his injuries, and was required to wear a neck brace to hold up his head until he got stronger. Now nine weeks old, Binx has regained some of his motor coordination and is growing stronger, but still has ongoing issues with his eyesight. The BC SPCA has arranged an appointment with a veterinary eye specialist for the tiny kitten on Jan. 3 for follow up treatment. Binx and Beans are both being fostered by Ott and the two little survivors are becoming fast friends as they continue their recovery. “No animal should face such adversity, especially at such a young age,” says Chortyk. “We really want to see them both healthy and in permanent, loving homes as soon as possible.” She notes that both Binx and Beans will require more treatment before they are ready for adoption in the New Year. If anyone is able to help with the ongoing medical costs for Binx and Beans and other animals in need, donations will be gratefully received online at spca.bc.ca/support, by calling the Burnaby SPCA Branch at 604-291-7201 or by dropping off or mailing your donation to the BC SPCA’s Burnaby Branch at 3202 Norland Avenue, Burnaby, V5B 3A6. Photo caption (top): Binx, kitten, and Beans, Yorkie pup were both rescued by the BC SPCA Burnaby Branch. Photo caption (middle): Binx, kitten, and Beans, Yorkie pup. 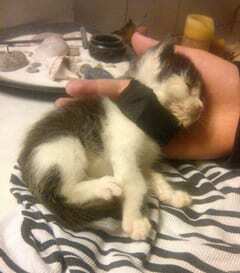 Photo caption (bottom): Binx, kitten, wearing a neckbrace after suffering extensive injuries, including head trauma and eye damage.